Though you might not know exactly what a balustrade is, you probably encounter one more often than you’d expect. Found lining many staircases and terraces, a balustrade is a row of small columns topped by a rail. The term is derived from the form’s constituent posts, called balusters, a name coined in 17th-century Italy for the bulbous item’s resemblance to blossoming pomegranate flowers (balaustra in Italian). “The balustrade’s functions are multiple, from reducing the possibility of a person falling off a stairway to cordoning off an area for the purposes of privacy, such as the gilded balustrade that separates the bed in the king’s chamber at Versailles from the rest of the room,” says Mitchell Owens, Architectural Digest’s decorative arts and antiques editor. A decorative balustrade lines the roof of this Palm Beach, Florida, residence designed in a combination of the Beaux Arts and Mediterranean Revival traditions. The earliest examples of balustrades comes from ancient bas-reliefs, or sculptural murals, dating from sometime between the 13th and 7th centuries b.c. In depictions of Assyrian palaces, balustrades can be seen lining the windows. Interestingly, they don’t appear during the architecturally innovative Greek and Roman eras (there are, at least, no ruins to prove their existence), but they resurface in the late 15th century, when they were used in Italian palaces. 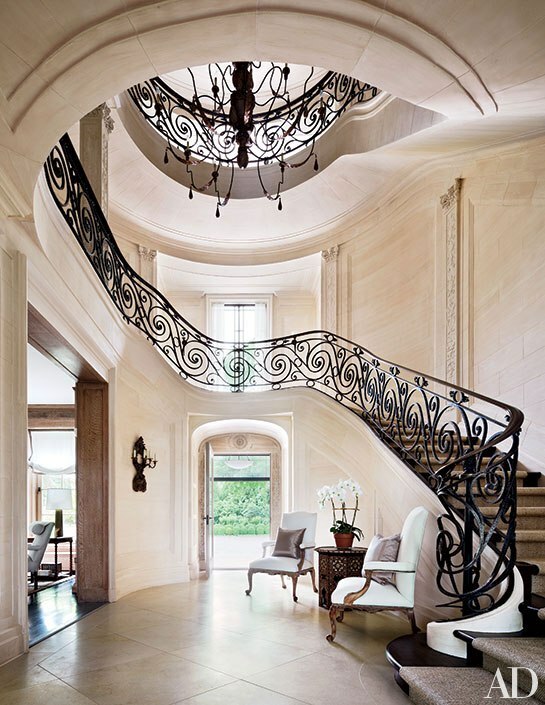 At a Water Mill, New York, home, a wrought-iron balustrade wraps the serpentine staircase in the entrance hall. A notable example of the architectural element once graced the Castle of Vélez Blanco, a 16th-century Spanish structure designed in the Italian Renaissance style. 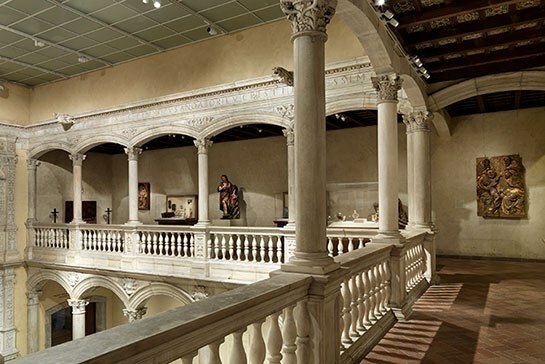 The intricate marble balustrade lined a second-floor walkway overlooking a courtyard. The ornamentation around the terrace was disassembled in 1904 and eventually sold to banker George Blumenthal, who installed it in his Manhattan townhouse. The patio has since been reconstructed in New York’s Metropolitan Museum of Art. Balustrades continue to be used today in a vast variety of shapes and materials, from simple wood posts to elaborate wrought-iron spindles, for both decorative and practical purposes.